I occasionally need exactly a cup of water boiled for tea. Whenever I boil the kettle to do so, I wonder if it would be more energy efficient to use the microwave, as then I would have exactly the right amount of water, which pressumably would reduce waste; however I suspect this is actually a complex issue - does anyone have some maths to hang that I can plug numbers into? This does, of course, generalise into: do I ever need a kettle? Use the kettle if you have one, and if you're nearby, switch it off as soon as it boils. Measure 252g of cold tap water into Frog Mug using electronic kitchen scales, being the amount I'd use to make a cup of tea. Temperature according to my thermometer is 18 degrees C.
Plug microwave in through power meter. 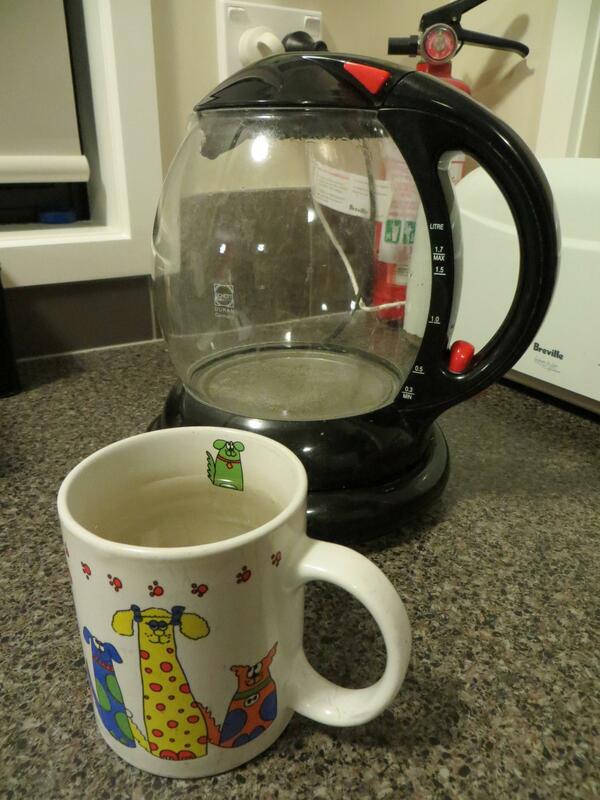 See how long the water in the Frog Mug takes to boil in the microwave, and measure wattage used. Measure 252g of cold tap water into Dog Mug using electronic kitchen scales, being the amount I'd use to make a cup of tea. Temperature according to my thermometer is 18 degrees C. Add a little extra because otherwise I end up with lime scale from the kettle in my tea. Though I picked this amount roughly, this worked out to be 121g giving 373g altogether. I could've used a little less. Pour the 373g of water into the electric kettle, and plug it in through the power meter. Boil the kettle, measure the wattage, and time how long it takes to boil. My thermometer only goes up to 50 degrees C, so I very briefly took out the Frog Mug at 30s and 50s to measure the temperature, which was 32 degrees and 40 degrees respectively. I put it on for a further 2 minutes after that, for a total of 2 minutes 50 seconds. Though it was a little hard to see through the mesh in the microwave while it was running, the water just started to appear to boil after 2m50s. The microwave used 1315 watts of power throughout the test, thus using a total of 223550 Watt-seconds of power. If I did my calculations correctly, this is 0.062kWh (which costs a bit under 2 cents here). It took 1m 28s for the water to start to boil in the kettle, however it didn't automatically shut itself off until 1m52s. The kettle used 990 Watts of power, which gives a total power usage of 110880 Watt-seconds, or 0.031kWh. The microwave would also have been heating the Frog Mug as it heated the water, so this gives a hotter cup of tea than the kettle, unless some hot water from the kettle is swirled around the mug and discarded before pouring from the kettle. Water in a lighter (or less thermally conductive) mug would boil quicker. The heat lost by my measuring of the temperature of the water in the Frog Mug would probably have been fairly minimal, but still non-zero. My Frog Mug weighs 366g, though I have a mug of similar size that only weighs 252g. Also bear in mind that boiling water in the microwave can sometimes be dangerous. The microwave (a Sharp Carousel) was purchased in approx 2004; I don't know if more recent models are any more efficient. 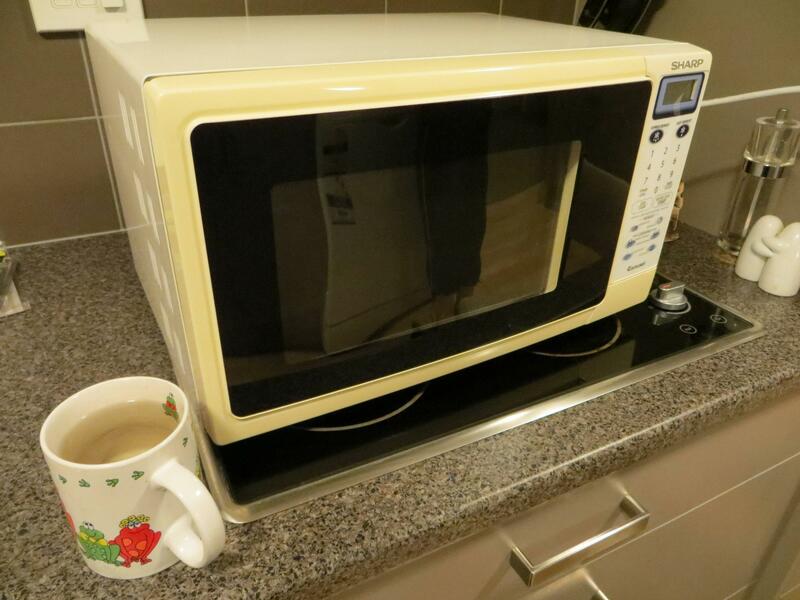 The water heated by the electric kettle used only about half the energy of the water heated in the microwave, despite a greater amount of water being heated. I could have saved a further 23760 Watt-seconds (21% of the total used), or 0.007kWh of power if I manually switched off the kettle when it first started boiling. A typical consumer microwave oven consumes 1100 W of electricity in producing 700 W of microwave power, an efficiency of 64%. The other 400 W are dissipated as heat, mostly in the magnetron tube. Additional power is used to operate the lamps, AC power transformer, magnetron cooling fan, food turntable motor and the control circuits. Such wasted heat, along with heat from the product being microwaved, is exhausted as warm air through cooling vents. Additionally, it seems that not all the microwave power is converted directly to the heat. Given that, for the good-quality kettle, power efficiency is close to 100%, boiling one cup of tea in a microwave oven requires the same energy as boiling 1.5 (or more) cups of tea in a kettle. If you consume the tea in significant quantities, the most efficient way would be to use an electric water boiler. Heat losses in these are close to zero, so it is okay to boil more water than you need at the moment; and power efficiency is close to 100% (as nearly all the electricity is converted directly to the heat). Additionally, you wouldn't have to waste your time waiting for the water to boil.